Lovely Sam of Beck & Posh chose vegan theme for this month’s IMBB. I never knew that vegans are called by these names or they feel that way about themselves here in US until I read her introductory post to this event. With much improved knowledge of stereotypes, here is my vegan contribution, ‘cashew sweet’: a traditional snack, my mother used to prepare and give us after school, when we were kids. The only thing I did differently because of vegan theme is I applied peanut oil to the settling pan instead of ghee. The following recipe is simple, easy and adaptable to other types of nuts particularly peanuts. In a large sturdy pan, combine jaggery and water. Cook over medium heat, stirring, until jaggery dissolves into water. Bring this to a boil. You see lot of bubbling and raising to the surface action going on by now. Stir, stir and stir until the jaggery syrup reaches soft- crack stage meaning when you drop a bit of this syrup into cold water, it will solidify into threads. When jaggery syrup reaches this consistency, immediately & quickly add cashews, and stir constantly for few minutes. Turn off the heat and pour this mixture onto a greased pan. When it is still hot, make lines with a knife and leave it to cool. When cooled, break along the lines to make squares. Store them in an airtight container. These Cashew brittles or tikkis are natural-food alternatives to the very fatty and sugary standard editions, a sublime and perfect pairing of nature’s goodness and man’s intelligence (or is it sweet tooth). The flavor is completely different and the jaggery really sings out. Go on.. try them. 1. Only a small quantity of water is sufficient while making the syrup. One cup of water is enough for upto 3 cups of jaggery powder. 2. Time it takes to make this sweet is maximum 30 minutes. Prepare to spend all this time infront of the stove, no multitasking. 3. And the most important thing is gauging the jaggery syrup readiness. When you are making this sweet, or any kind of brittle for that matter, always keep a cup of cool water by the stove side. You can check the readiness by drizzling a few drops of syrup into the cool water. If it forms strings that you can easily prod into a ball, it’s at the soft-crack stage. This is where you should add nuts to the syrup. As soon as you add the nuts to the syrup, the mixture starts to solidfy or reaches the hard-crack stage very fast, within a couple of minutes. You made a perfect brittle. If the syrup dissolves and disintegrates in the water, the syrup is not cooked enough yet. If it tightly balls up and sinks to the bottom or if syrups color turns from gold to black, then you have overcooked it. This website very clearly demonstrates the various stages of sugar syrup, check it out if you want to know more about candy making. It also has video demonstration of various sugar stages (applies to Jaggery syrup too) both in real player and quick time, cool! Checkout cute kitties and doggies of food blogging world. For my first ever virtual blog party, a monthly event started and hosted by lovely Stephanie of Dispensing Happiness, I made these little golden parcels of potato-pea filling in all purpose flour wraps and a pitcher of refreshing watermelon juice. They are a hit in my house, a party of two. Hope the hostess approves my contribution. Prepare the curry by sautéing the above ingredients. 1. Prepare a firm dough by mixing one cup of all-purpose flour, half cup of water and a pinch of baking powder & salt. Keep it aside for at least half an hour. Meanwhile prepare the curry. When the curry is ready and cool enough to handle, take out and divide the dough into small balls. And with a rolling pin, roll out the rounds. Or simply use wonton wraps. 2. Take one teaspoon of cornstarch in a cup, make a paste by adding little water. 3. In each wrap, put a teaspoonful of curry mixture in the center. Make a line of cornstarch paste around, about half inch from the edge. Bring all four corners to the center and press together firmly to form little bags. 4. In batches, deep-fry them in oil until golden brown. Makes about 15 to 20. I don’t have chives at home right now; otherwise I could have tied a chive around the neck of each bag as garnish. 5. Serve them with a dipping sauce of your choice. I bought okra (benda Kaayalu) from Wal-Mart supercenter’s frozen section last weekend. As mush as I detest Wal-Mart business practices, I still shop there occasionally for groceries during fall and winter times, as we live in a rural area, and fresh vegetables that I prefer are really pricy after the summer. This behemoth shop carries quite a range of fresh and frozen vegetables at affordable prices year long. After reading some of the fellow food bloggers posts about okra, I was tempted to dish out my favorite okra recipe from Nandyala, the famous bendakaaya sambar (okra sambar). Smooth and silky okra when cooked in sambar, absorbs all the wonderful flavors of sambar spices and takes ‘I can’t believe this is okra’ kind of avatar, and goes down without resistance when eaten. 1 cup of Toor dal - In a pressure cooker, take toor dal and water in 1:2 ratio, cook to soft, and mash the dal to smooth consistency. 1 teaspoon each - cumin, coriander, fenugreek seeds, chana dal, urad dal and dry coconut, Dry roast. Cool. Powder them together to fine. Or buy readymade sambar powder from an Indian store. We need atleast a tablespoon of sambar powder for this recipe. Soak key-lime sized tamarind in half cup of water for 10min. This will soften the tamarind. Squeeze the pulp and discard the seeds. Salt, red chilli powder and turmeric - half teaspoon each, or to taste. In a big pot, take peanut oil. On medium heat, do the popu or tadka(toast curry leaves, garlic, cumin and mustard seeds). When seeds start to pop, add the onions and saute to soft. Then add tomatoes and okra pieces. Also stir in sambar powder, red chilli powder, turmeric, salt, tamarind and one glass of water. Bring to a boil. Then reduce the heat, cover the pan, let simmer for about 10-15 minutes or until the okra is tender. Add the cooked and mashed toor dal to the simmering contents in the pot. Mix and have a taste. Adjust the salt and chilli powder to your taste and bring to a boil. Let it simmer for about 15 minutes. Turn off the heat. Garnish with coriander leaves and serve. I usually let it sit for at least for about 15 to 30 minutes, so that when it is served, you can actually taste the flavor of sambar powder. Take a look at Kiri in his new jumper suit, knitted by Clare, herself. Ahh.. kitty love. Lovely Elise of Simply Recipes selected custards for this month’s “Sugar High Fridays” theme. I know that I am not a big fan of custards. Still I wanted to give it a try. Why not? How I felt about certain foods changed with time and may be with the recipe I selected, I might like it. You never know until you try. So, I baked mini custard tarts. The recipe is simple with only 5 ingredients. All Purpose Flour, butter, powered sugar, eggs and milk. Tart shell is made with the first three ingredients and the custard filling is made with the last three ingredients. All basic, nothing fancy sounds easy, right, so I gave it a try! To make the dough, sift the all purpose flour into a bowl. Add the powdered sugar, butter and water. Mix and knead to form a smooth, firm dough. Cover and leave to chill in the refrigerator. Meanwhile prepare the custard filling. To make the custard, beat the eggs and sugar together. Gradually add milk and beat until well combined. Take out the dough from the fridge; divide it into even sized pieces (makes about 6). Flatten the dough pieces into rounds and press into shallow tiny pans. Spoon the custard into the tart shells and cook in a preheated oven at 325° F, for about 30 minutes or until set. Remove the dishes, set aside to cool. To serve, run a knife around the edge of each dish and turn out onto a serving plate. Serve hot or chilled with or without cream. The outcome looked, smelled and tasted good. But I am not going to go ga-ga over custard anytime soon. I should have baked a cheesecake instead. I read somewhere that cheesecake is also a sort of custard. Yum… that’d be the one I like more! Take a look at custard and its many avatars at Elise’s Blog . 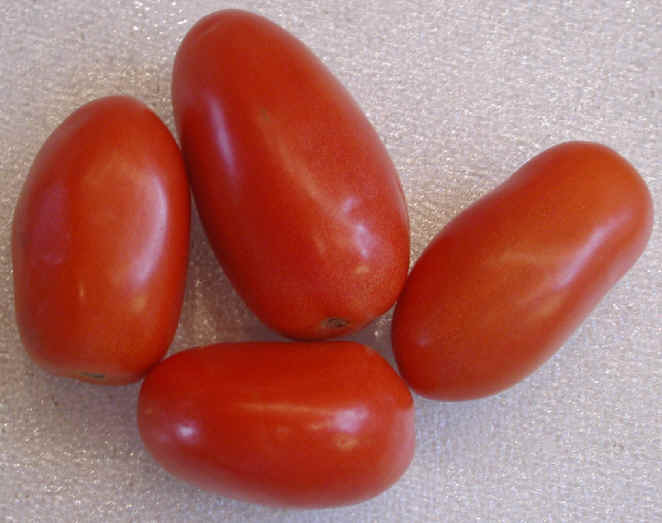 Few roma tomatoes, each cut into five round slices, tossed in salt and pepper, then baked on a foil covered tray in the oven at 350°F for about 45 minutes. My first time making these and I am surprised at how easy it was to prepare them, and how good they tasted. Because I chopped them thin, I didn’t had to cook them for 3 to 4 hours in the oven. Troubles with dusting powder - from Bakerina. From Chennai - serving food as a ritual. If you are interested in Indian food, not familiar with the terminology, take a look at -”Indian food primer for an interested American” - . Kittaya looking through the glass. Alex and Macroom, I can’t decide who is more adorable. And also checkout different poses of Kiri and the gang.